I'll admit that this isn't the prettiest slice of cake, but I'll also admit that I tried my hardest to cut it prettily. I admit that... well, who cares if it isn't pretty? It's tasted ridiculously good!!! It tasted so good, in fact, that I made this cake twice. The first time I made this cake, I took it to my neighbor's house, and it vanished into thin air. The second time I made it was for my house. You see, my dad is an incredibly huge fan of pineapple and coconut, specially if they're paired together. Since he didn't get to try the first cake that I made, he requested I make it a second time. Let's just say, my dad was the king of the cake kingdom. He ate almost all of it. I ate like 2 slices, and my mom another two. He could not stop gushing about how light the frosting was, how good and pineapple-y the filling was, how good the frosting paired with the filling that was just below it, hot pretty the cake looked, etc. Now, he's requesting it for every special event and holiday, so I think we'll all be getting our share of this cake, which is featured in Nancie McDermott's Southern Cakes. 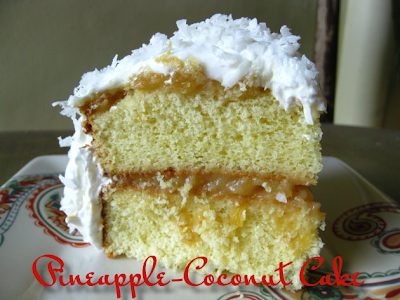 "Pineapple sings out a sweet-sharp summery note when included in the rich confection that is coconut cake. Making the simple filling is quick work, and you can compose the cake using any layers and frosting that you like best. This version combines a simple yellow layer cake and an ethereal, meringuelike icing topped with a blizzard of coconut. Make the pineapple filling while the cake is baking, and whip up the glossy white frosting when the cake is cool enough to be iced." 1) To make the cake, heat the oven to 325F and grease and flour two 9-inch round cake pans. Combine the butter and milk in a small saucepan, and cook over low heat until the butter melts. Stir well and set aside to cool to room temperature. 2) Meanwhile, in a medium bowl, stir together the flour, baking powder, and salt with a fork, and set aside. In a large bowl combine the eggs and sugar, and beat well at high speed, scraping down the bowl often, until the mixture is pale yellow, smooth, and thick. 3) Stir the flour mixture into the egg mixture, using a large spoon or spatula to mix only until the flour disappears. Add the cooled milk and the vanilla, stir until smooth, and divide the batter between the prepared cake pans. 4) Bake at 325F for 25 to 30 minutes, until the cakes are golden, spring back when touched lightly at the center, and begin to pull away from the sides of the pans. Cool in the pans on wire racks or folded kitchen towels for 10 minutes. Then turn out the cakes onto wire racks or plates to cool completely, top side up. 5) To make the filling, in a medium saucepan, combine the pineapple, sugar, butter, flour, and salt, and bring to a gentle boil over medium-high heat. Reduce the heat to maintain a gentle simmer, and cook for about 5 minutes, stirring often, until the butter melts and everything comes together into a chunky sauce. Remove from the heat and cool to room temperature. 6) To make the frosting, bring about 3 inches of water to an active simmer in the bottom of a double boiler or a medium saucepan. In the top of the double boiler, or in a heat-proof bowl that will sit snugly over the saucepan, combine the egg whites, sugar, pineapple juice, and corn syrup. Beat with an electric mixer at medium speed for 1 minute, until the mixture is pale yellow and very foamy. Place the double boiler top or the bowl over the simmering water, increase the speed to medium-high, and beat for 7 minutes or more, until the icing becomes white, thick, and shiny, and triples in volume. Continue beating until the frosting forms soft peaks. (This process could take as long as 15 minutes.) Remove the frosting from the heat and beat for 2 minutes more. Frost the cakes as soon as possible. 7) To complete the cake, place one cake layer, top side down, on a cake stand or serving plate, and cover it with about half of the Pineapple Filling. Spread the filling almost to the edge of the cake. Place the other layer, top side up, on the filling, and spread it with the remaining filling. Cover the sides and then the top of the cake generously with the frosting. Place the cake on a cookie sheet or tray to catch any coconut that doesn't stick to the cake. Sprinkle the shredded coconut generously all over the top and sides of the cake, and then carefully pat coconut on any bare spots. Thanks for an AmaZing recipe! I'm making it again today - hope it turns out delish! Thank you for an awesome recipe!